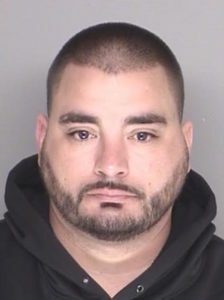 The Santa Barbara County Sheriff’s Office has identified the man who was shot and killed early Saturday morning in the back parking lot of Elmer’s bar in Old Town Orcutt. Sheriff’s officials also announced they arrested the murder suspect, as well as his wife, who is accused of being an accessory. Around 1:30 a.m., Jonathan David Highley, 35, shot and killed Anthony Steven San Juan, 43, according to the sheriff’s office. Detectives have yet to determine a motive for the murder. They are also unsure of the relationship between Highley, who is from Orcutt, and San Juan, who is from Santa Maria. Highley fled the scene following the shooting. But, shortly after 9 a.m., detectives took Highly into custody as he was leaving his home with his wife and four children, a sheriff’s office press release states. Deputies transported Highly to the Santa Maria Sheriff’s Station. After processing the crime scene, gathering physical evidence and interviewing several witnesses, detectives arrested Highley for murder. Highley was also charged with preventing or dissuading a witness by force or threat, assault with a firearm on a person, threatening a crime with intent to terrorize and intentional discharge of a firearm in commitment of a felony causing death. Authorities requested that Highley’s bail be set at $2 million. Deputies arrested Highley’s wife, Mayra Perez, 29, on an accessory charge. Perez was booked in jail, and Child Protective services took custody of the couple’s children. Investigators do not believe there are any outstanding suspects. What’s the problem? They left their 7 year old daughter home to babysit the three younger children. Selfish parents put themselves first. Now these children are without both parents. It’s just as unfortunate as the children who recently lost their mother when she decided that getting in the car with a drunk driver and her “good time” was more important than the three little ones at home. Wow, nice victim blaming, tidepool. I don’t know, if I was married for 15 years and had 4 kids at home, I might want to go out for a drink on an occasional Friday night too! You don’t know his life nor do you know why he was there. For all you know, maybe he was a sober driver picking up a friend from that bar and got into a confrontation. There is zero evidence in the article that he was 1) a frequent bar-goer 2) an alcoholic 3) a bad parent 4) or even had a single drink in his system. So before you smear the good name of an innocent victim, you might wait for more facts to come out. Sorry, I misread what you said and thought you were talking about the victim (who had kids at home too). Yeah, Highley is a total dirtbag and his children are better off never seeing him again. Yea, of course your right. That might be the case. Sorry for jumping to conclusions.